There is a lot more to Portuguese wine than its world famous fortified Port Wine as I discovered on a recent visit to Portugal. While an older generation of Indians may be familiar with Mateus Rose and a discerning few might have heard of the inexpensive zesty white wine Vinho Verde, Portuguese wines still remain somewhat of an enigma. It is the unfortified table wines from Portugal and its flagship red grape variety Touriga Nacional which is now making the world sit up and take notice. The light and fresh Vinho Verde from the cooler Minho region of northwest Portugal, the robust red blends and intense whites from Douro, the elegant balanced wines of Dão, Bairrada reds with their high acidity and tannins, full-bodied compelling whites from Alentejo, these are wines with a distinct personality that are going from strength to strength in terms of quality and international recognition. It is quite amazing how such a small country produces an array of diverse wines from indigenous grape varietals, most of which the world still does not know much about. Very frankly this works to Portugal’s advantage, as a lot of people are bored of drinking Chardonnay and Cabernet Sauvignon and would like to experiment with new flavors and styles. And Portuguese wines do carry that stamp of “uniqueness” as they are not mere clones of French, Spanish or Italian wines. These wines speak of history, culture and its microclimate, in other words, they speak of Portugal. A factor which works in Portugal’s favour is that its wines are relatively inexpensive compared to French and Italian ones and this combination of high quality at bargain prices makes them all the more appealing to wine lovers. A visit to Portugal in July 2016 exposed me to the beautiful and beguiling world of Portuguese wines. It turned me into a fan of the country, its people and its wines. 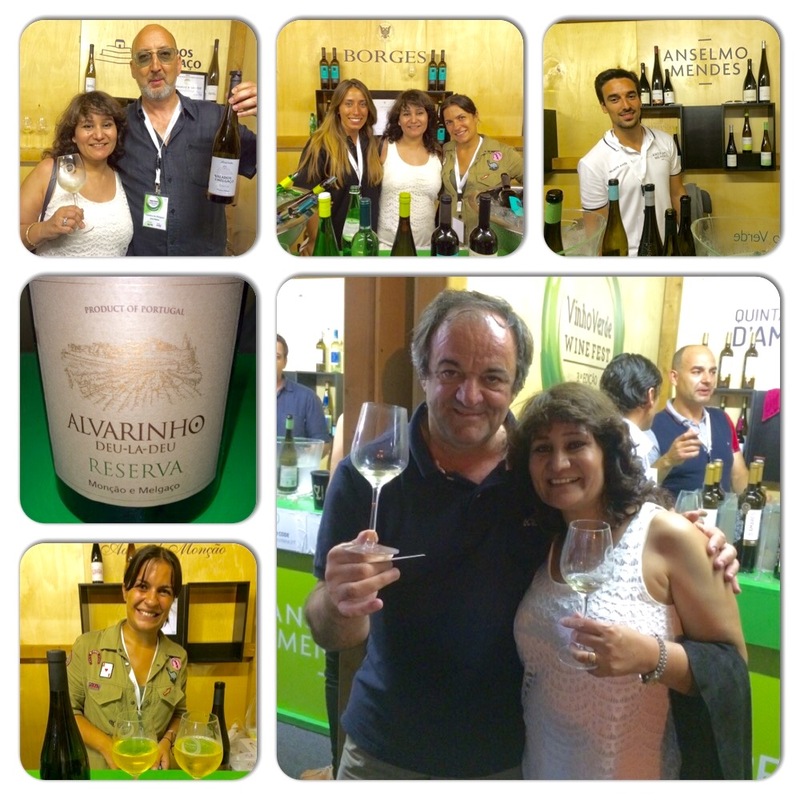 In fact, I happened to be in Porto on July 22nd 2016 when the Vinho Verde Festival was going on and was fortunate to meet Anselmo Mendes, recognised as one of Portugal’s top white wine producers and a legend of sorts. He is an Alvarinho specialist who makes some very fine Vinho Verde. For those unfamiliar with this style, Verde means “green” or young as opposed to maduro or mature. They are the second most exported wines in Portugal after Port. These wines are fresh, zippy with bright acidity and low alcohol (9-11%) and most are released 3-6 months after harvest. Some have a slight fizz. Most wines are a blend of local castas (grape varietals) Alvarinho, Loureiro, Azal, Arinto, Avesso and Trajadura. I tried out Vinho Verde from several well-known producers like Borges, Quinta (Estate) de Golães, Deu-La-Deu and Anselmo Mendes. However, the best Vinho Verde that I tasted was not in Portugal but right here in New Delhi at the residence of the Portuguese ambassador to India H.E João da Camara where Wilson Teixeira’s “Madhu of Portugal”, a web-based platform with a mission to introduce the world to great Portuguese wines and India’s top Sommelier Magandeep Singh’s Wi-Not Beverage Solutions Pvt Ltd had organized a masterclass and wine tasting. Both of them had travelled around Portugal and brought wines to India from some leading producers for select sommeliers, consumers, wine importers & F&B professionals to try out, in the hope that they will evince interest and bring the brands to India. One of the outstanding wines at the tasting was a Vinho Verde made from the regional celebrity grape Alvarinho from the much awarded winery Reguengo de Melgaço located in the subregion of Monção and Melgaço in north Portugal bordering Galicia in Spain. Fruity, intense with a lovely minerality and unctuousness, it had balanced acidity and slightly higher alcohol (nearly 13%), not typical of the style. The spumante or sparkling from this winery also made with 100% Alvarinho had fine persistent bubbles and a creamy mouthfeel. Both wines were gorgeous. 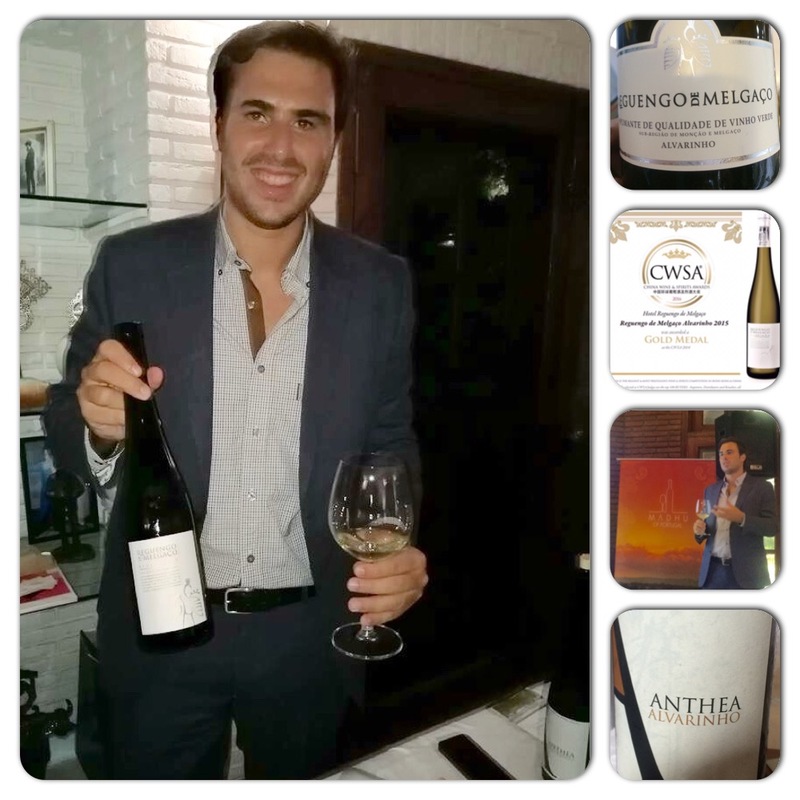 Mario Fernandes of Reguengo de Melgaco at the residence of Portuguese Ambassador in New Delhi showcasing his wines. Another impressive wine was from Cartuxa Winery in DOC Alentejo in southern Portugal, the Cartuxa Evora Tinto Colheita 2012, winner of silver medal at the 2016 Decanter World Wine Awards. Cartuxa is a premium brand of Eugenio de Almeida Foundation whose other labels include EA, Foral de Evora, Scala Coeli and the legendary Pera-Manca (which I was fortunate to taste thanks to Magandeep). Cartuxa has been selected as a leading Portuguese Superbrand in 2015 for the fourth consecutive year for both wine and olive oil. The third producer whose wines impressed the gathering was Quinta do Silval from DOC Douro, Portugal’s most famous wine region which was declared a World Heritage Site in 2001 by UNESCO. It is the first wine producing region of the world to have a formal demarcation (Região Demarcada do Douro) created by Marquis de Pombal on 10th September 1756, now celebrated as World Port Day. Quinta do Silval’s “A-rated” vineyards are located at Vale de Mendiz in the Pinhao River Valley of Douro. They produce elegant Port wine under the brand name Magalhães and have created Dorna Velha brand for their non-fortified table wines. We tasted these wines along with some superb Ports including Magalhães 2008 LBV (Late Bottled Vintage), Ruby Special Reserve and Magalhães Vintage Port 2003 & 2004. The single-quinta (estate) vintage port from Quinta do Silval has won high praise at Decanter Magazine tastings, wowing critics for its good value, depth & fruit concentration and well integrated rich tannins. 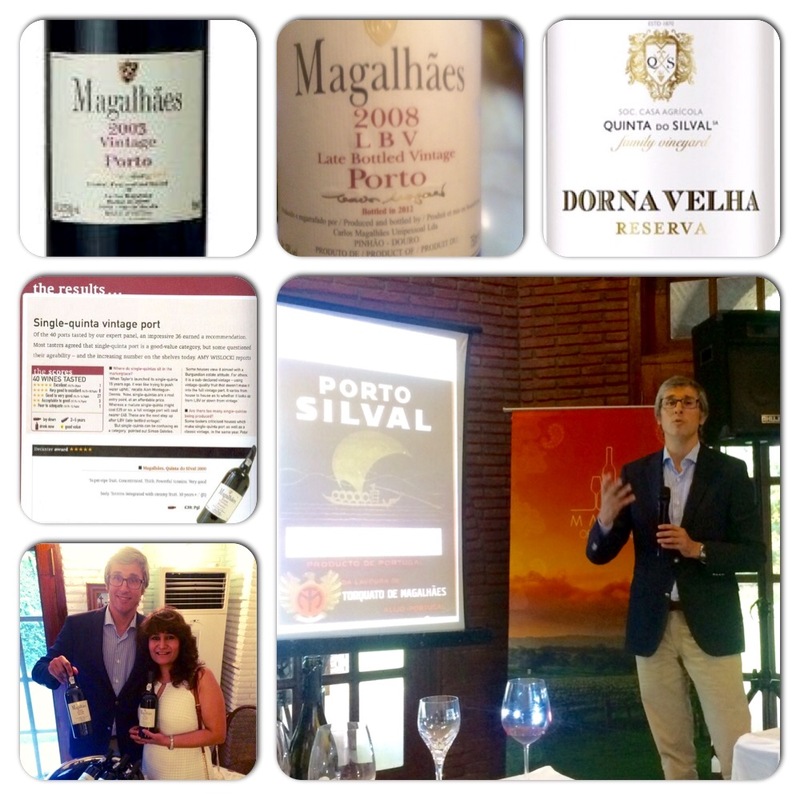 Alexandre Magalhaes of Quinta do Silvas with his much acclaimed wines. 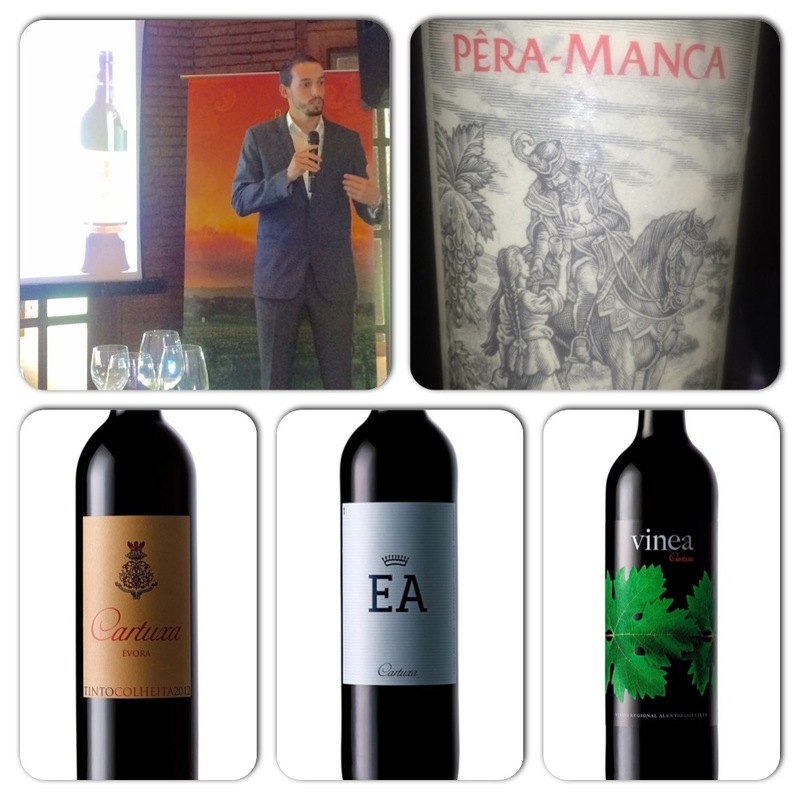 The other wineries represented at the tasting were Anselmo Mendes (DOC Vinho Verde) Borges (DOC Porto/Douro and DOC Dão), José Maria Da Fonseca (DOC Setúbal), Sogrape (DOC Porto/Douro) & Monte da Raposinha (DOC Alentejo) whose Furtiva Lágrima Tinto 2010 was another favorite of mine. It is time that Indian wine importers shift their attention to Portuguese wines just like the rest of the world is doing. Wine consumers in India should not be deprived of access to wines from this beautiful country.